Exactly two years ago, in August 2008, Westminster City Council in central London introduced a motorcycle parking tax in a view to raising revenue and rescuing a broken council, which this year happens to suffer from a £22 million budget overspend. The No To Bike Parking Tax (NTBPT) campaign was formed right from the start, when the parking tax was introduced, to fight against this evil attack on motorcyclists, who are keen to use a mode of transport that relieves congestion and pollution and also offers a reliable and economical way of moving around the British capital. But Councillor Danny Chalkley, the Tory councillor in charge of parking at the time, didn’t see it from this angle at all. To the contrary, with the assistance of Alastair Gilchrist, the Director of Parking at the time, they both came up with a series of fake and non-sense excuses to charge motorcyclists for parking in central London, with the help of old school Councillor Susie Burbridge who tried hard to convince everyone that “motorcycles, even small ones, pollute more than hummers”. Susie went on saying that she came across this statement on a French website while surfing the internet during her working hours, when she was actually supposed to serve her hard working residents who elected her to precisely improve their living environment and conditions. Maybe Susie needs to attend a few French classes to make sure that her translation skills are kept up to date from when she attended school a long time ago. And let’s not forget that Susie is one of the many Westminster Tory councillors who offer themselves the benefit of a free official parking permit to park their hummers anywhere they like in the city, without paying a penny. In the opinion of Westminster City Council, motorcycles are a nuisance and their use should be discouraged. Of course, that makes perfect sense, since motorcycles heavily congest, take as much space as cars or vans and pollute as much as four wheel vehicles. So why would they not be treated like cars? After all, since motorcycles pollute more than hummers, it makes sense to discourage their use. But the vast majority of bikers don’t agree with the council and we don’t blame them. This is the reason why the NTBPT campaign has grown so much over the last 24 months, precisely because the justification used by Westminster City Council to charge motorbike and scooter users is a complete non-sense. The charge is there for one and only one purpose, that is to bring in revenue and benefit private companies contracted to enforce the charge and provide the required pay by phone technology. This parking tax is nothing but a pure money grabbing scheme imposed on a group of road users keen to benefit the environment. We sometimes wonder why we should make efforts to go green because when we do, we get penalised for doing so. The NTBPT campaign has now applied for permission to appeal the court decision made last month in favour of Westminster City Council with regards to the legality of the bike parking tax. The same NTBPT campaign is organising another massive national protest on the M25 London orbital motorway on 25th September 2010 and more traffic blockades in central London every Wednesday morning and evening during rush hour, with a lot more to come. While Westminster City Council thought that campaigners would go away after a maximum of four months following implementation of the bike parking tax, well some 24 months later, the number of them has been multiplied by more than twenty with one single idea in mind: get the bike parking tax scrapped. Well, one day, for sure, the NTBPT campaigners will celebrate victory. It’s just a matter of time before this happens. 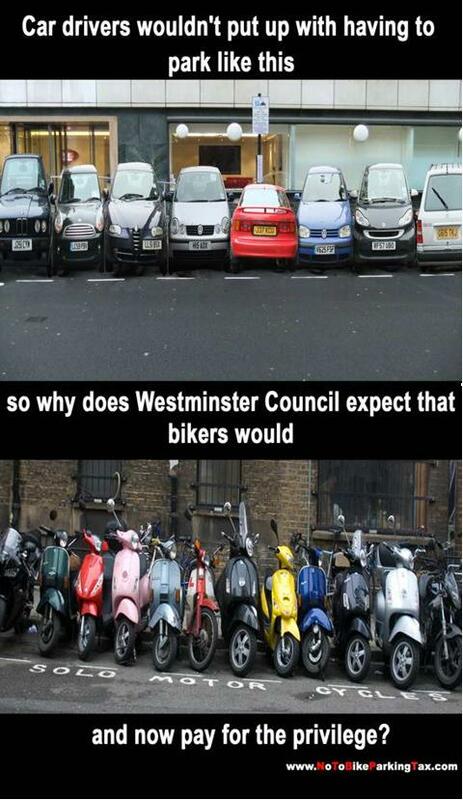 « Westminster Council will never get it right for the bikers, will they?